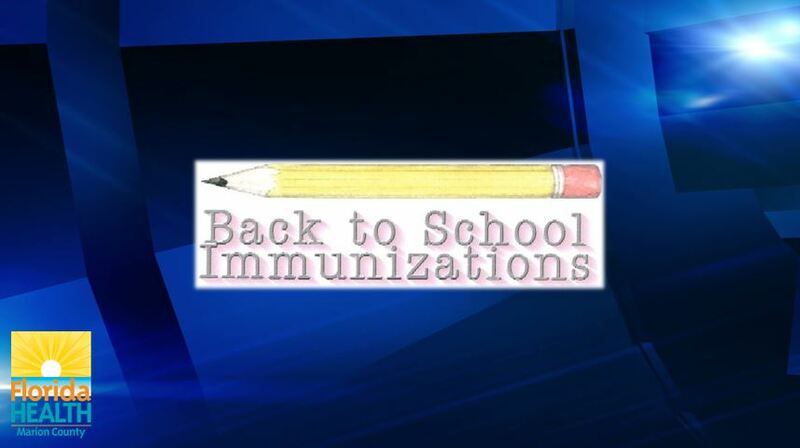 The Florida Department of Health in Marion County will be holding special walk-in immunization clinics starting July 31 for families whose students need shots before the first day of school. The clinics will run through Aug. 11 and will be open from 8 a.m. to 5 p.m. Monday through Friday in the department’s auditorium at 1801 SE 32nd Ave., Ocala. Students entering kindergarten, attending or transferring to a Florida public school need the following vaccines: four or five doses of DTaP (diptheria-tetanus-acellular pertussis); four or five doses of IPV (inactivated polio vaccine); two doses of MMR (measles-mumps-rubella), three doses of Hepatitis B, one dose of Tdap (tetanus-diptheria-acellular pertussis) and two doses of Varicella. All students entering seventh grade must have a Tdap booster (tetanus-diptheria-acellular pertussis). College immunization requirements can vary; entering students should contact their schools to see what is required. More information about requirements can be found at www.floridahealth.gov/programs-and-services/immunization/children-and-adolescents/ school-immunization-requirements/. When coming to get immunizations, individuals need to bring government-issued photo ID and all immunizations and travel records. A parent, guardian or individual who has power of attorney for medical consent must accompany anyone under age 18. A stepparent, grandparent, adult sibling of the minor, or an aunt or uncle can bring a minor child in for immunizations if they have written consent from the parent, legal guardian, or individual with power of attorney for medical consent; the parent/guardian/individual with power of attorney must be reachable via telephone in this situation.